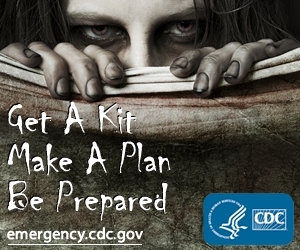 In an unusually well thought of step by a government agency, the CDC has released information on how to prepare for a zombie-related crisis. This site focuses on creating a ‘bug-out bag‘ and making an emergency plan to meet with family friends in the event of a crisis. This is good information for any type of disaster and to the CDC’s credit, it does not emphasize hoarding weapons. This may seem counter-intuitive but taking a survivalist ‘gun-nut’ route is a surefire recipe for disaster. Other survivors often try to steal weapons from heavily armed survivors. More importantly it causes others to distrust you, as they fear you are a mentally unbalanced sociopath more dangerous than the undead.